Chimneys with a stainless steel liner require cleaning as frequently as other types of lined, and unlined, chimneys. Each type requires a slightly different cleaning process to clean the chimney properly. Inspect the chimney monthly by allowing the stove or fireplace to cool, holding a flashlight on a mirror under the chimney and using the mirror to direct the flashlight beam up the chimney for visualization with the mirror. If there is creosote build-up at any point on the stainless steel liner, the chimney should be cleaned to reduce the risk of a chimney fire. Clean the stainless steel chimney liner while standing on the roof if possible. Remove the doors to the fireplace or stove. If necessary, use a pair of pliers to remove the cotter pins holding the top draft in position in the chimney liner. Wear gloves to protect your hands from possible sharp metal on the draft disc. Open the chimney clean-out door, if there is one, to be sure it is functional. The clean-out door is usually located at the lowest part of the chimney. If it is functional, close the door. If not, make repairs needed for opening and closing. Place plastic sheeting over the opening for the fireplace or wood stove and secure all edges with tape. Place a ladder against the roof beside the chimney on a level surface, climb the ladder and work on the chimney from the roof if possible. Remove the chimney cap. If the cap was screwed into position, place screws back in the holes after removing the cap so the screws do not get lost or fall off the roof. Set the chimney cap aside on the roof after inspecting and cleaning if necessary. Attach a nylon poly chimney brush made for stainless steel liners to a rod or rope attached to a weight. Drop the weight in the chimney followed by the brush and allow the weight to pull the brush down the chimney and use the rope on the outside to pull the brush back up the chimney. Inspect the stainless steel liner after each two or three passes with the brush. If using rods, attach a rod to the chimney brush and clean each section thoroughly by pulling the brush up and down in each section until it is clean. Add another length of rod after a section is clean to clean the next section down in the chimney. Remove the brush from the stainless steel chimney liner. Take the plastic sheeting off the stove opening. 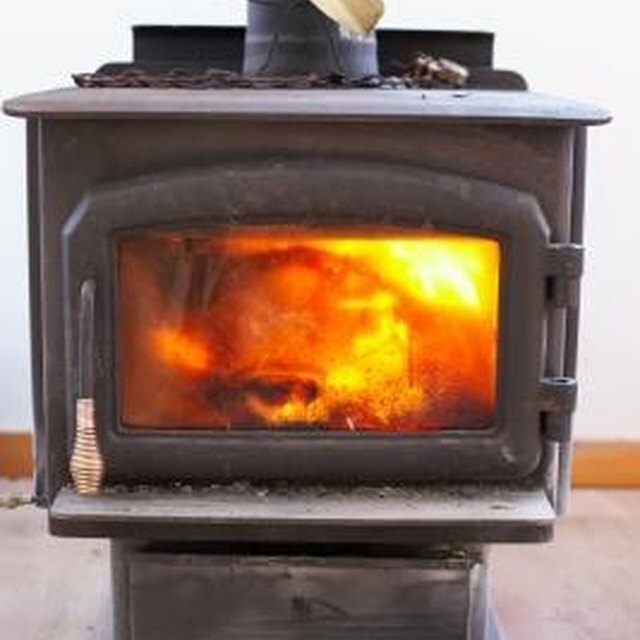 Lift the debris out of the bottom of the fireplace, stove and/or chimney clean-out and place into a container for disposal. Vacuum the remaining debris. Replace the doors on the fireplace or stove as needed. Replace the top draft with new cotter pins. Wear sturdy non-slip shoes while working on the roof to reduce the risk of a fall. Avoid inhaling dust from the chimney. How do I Repair a Sliding Glass Door that Sticks When Opening?